Sonic may have been born on the Mega Drive, but his debut 8bit adventure stands as one of his finest moments. Sonic the Hedgehog for the Master System is a curious thing. By the time Sonic arrived, the console was dead in both Japan and the United States, but still flourished in Europe and Brazil. Whilst this version was released for the Game Gear in the former territories, it’s the Master System version that became beloved by Europeans by virtue of replacing Alex Kidd in Miracle World as the systems built in game. 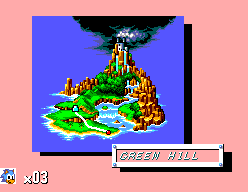 It was probably tempting for Sega to just release a stripped down version of the Mega Drive game, but as it is, only three of the stages made it into the Master System version; Green Hill, Labyrinth and Scrap Brain. Even these featured numerous differences, both in the design of the levels themselves and the way they played. Developed by Ancient, rather than Sonic Team, the game plays somewhat with what we now think of as the established Sonic formula. 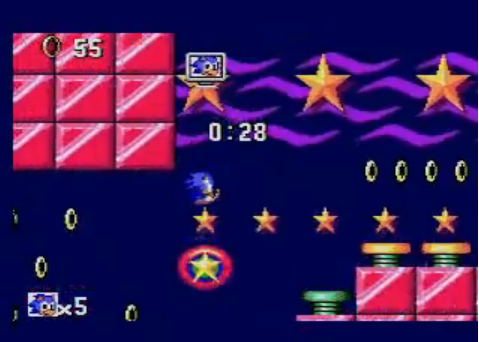 The second zone, Bridge features a continually scrolling screen in its second act, which forces you to move through the level whether you want to or not, but equally you can’t always go as fast as you want. This makes for an interesting approach at a few points, as if you want to use the weighted jumps, then you need precision timing, and the collapsing bridges are almost the length of the screen. Players who launched themselves headlong across them might find that they’ve run out of places to stand. There was also the extra life that was very easy to miss, being hidden below the screen, and required you to get back safely to a platform after hitting it, as it was suspended over the water that led to certain death for our aqua phobic hedgehog. The third zone, Jungle, had a deviating second act too, this time in the form of a vertical level. Once you moved up, the screen would stay there, and hitting the bottom would result in death. As a child, this became the most infuriating level. At times seeming almost impossible to do, with a misplaced jump seeing what you though would give you a safe zone suddenly disappearing and leaving horrible death behind instead. In the intervening two decades I’d say my skills have progressed somewhat, and with the entire game burned into my memory, I can frequently complete the entire game without death, let alone just this troublesome level. Given its unusual nature though, it tends to catch people out the first time they play. The level of difficulty is upped somewhat by Sonic only dropping a single ring when he’s hit no matter how many he’s carrying at the time. This turned the rings into little more than the bubble power up, meaning that mistakes attracted a much harsher punishment than on the Mega Drive. The other main difference comes in the power ups, or rather the lack of them. The power sneakers appear only on the first level (and can be used to skip almost all of it), whilst invincibility appears twice. One of these though (on the Labyrinth zone) is required to collect the Chaos Emerald. You’ve only just got enough time, and even now, the headlong dash for the spike pit where the Chaos Emerald lies is something of a rush. 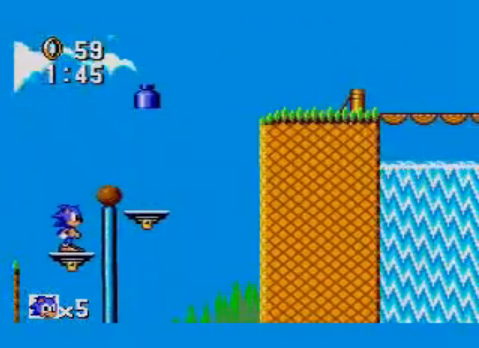 The Special Stages are different too, comprising of side-scrolling levels filled almost entirely of springs. Different colours correspond to different heights, which combined with the structures blocking your path means completing it within the 60 second time frame is not always possible, especially if you want to collect the hundred rings that will grant you an extra life, or indeed get the extra life monitor. Some may not like that the Chaos Emeralds were removed from these stages and places instead in the regular ones, but in all honesty, I preferred it that way. I have some great memories of searching the levels for the hidden gems, and it actually made more sense to me that there was one on each level than putting them in the Special Stages. Ultimately, these differences allow Sonic the Hedgehog to stand on its own. More than just a simple port, and more than a curious experiment, Sonic the Hedgehog stands as one of the defining moments of the 8bit era. It’s a true classic, remaining playable to this day, and can be found on the numerous Sega collections released over the last few years, and on the Wii’s Virtual Console. If you’ve not got a Master System, it would certainly be worth picking up. A perfect game by no means, but it’s certainly a very good one. With Sonic games suffering in recent years, this is a nice reminder of how Sonic can be different, yet familiar and most importantly, still fun.